What is the 3P Pledge? The 3P Pledge & the 3P Pledge Champion Award is a Scottish based community initiative led by the environmental education venture Wild Planet Explorers. The 3P Pledge asks every individual to pledge to only throw pee, poo & toilet paper down the toilet & nothing else, including flushable & biodegradable toilet wipes and sanitary items. The 3P Pledge then encourages everyone to take more action to tackle marine litter by completing the 3P Pledge Champion Award. The aim of the 3P Pledge & the 3P Pledge Champion Award is to stop the blockages & resulting overflow of toilet waste into local streams & rivers, on to beaches & into seas. This not only impacts on our safe enjoyment of our waters & beaches but also has a huge negative effect on wildlife in the seas through pollution, in particular through plastic ingestion. 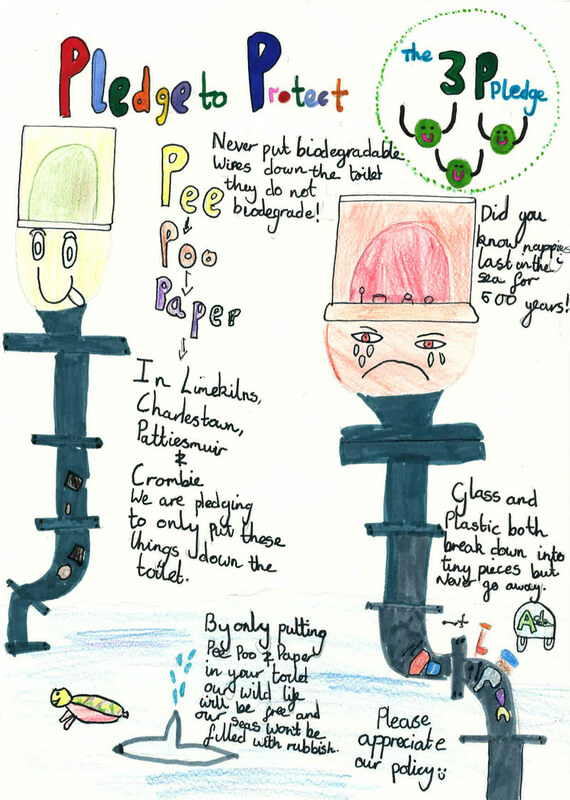 The 3P Pledge is mainly focusing on toilet related marine litter e.g. toilet wipes including biodegradable & flushable ones, sanitary items including sanitary towels and tampons, cotton buds, nappies, contact lenses, plasters and other items. All these cause blockages & flooding of these items on to our beaches & into our rivers & seas. The 3P Pledge and 3P Pledge Champion Award also shows how toilet waste fits into the wider issue of marine plastic pollution not just locally but also globally. To find out how bad litter really is on our UK beaches including sewage related litter, why not take a look at Marine Conservation Society's Beachwatch Report 2018 . The 3P Pledge aims to raise awareness of the issue by encouraging individuals, families, groups, schools, businesses, charities, organisations, nurseries, villages & cities to make the 3P pledge themselves but also encourage them to actively pass on the message of the 3P Pledge & take action to address the issue through becoming a 3P Pledge Champion & taking part in the 3P Pledge Champion Award. Scout groups, nurseries and schools are already taking part in the Award across Edinburgh and Fife, scroll through the posts on the Wild Planet Explorer's Facebook page https://www.facebook.com/wildplanetexplorers/ to see some of their amazing pledge pictures and photos of what they've been up to! 1. Make the 3P Pledge today & spread the message! Use & copy the below logo from this page & use on any other social media or publication that helps spread the message. When sharing your pledge, please share the Wild Planet Explorers 3P Pledge link http://wildplanetexplorers.co.uk/3p-pledge/ which helps others understand why you've made the pledge & the level of sewage on our beaches through the MCS Beachwatch 2018 litter report on the same page. 2. Become a 3P Pledge Champion for YOUR local village, street, town, city, business, charity, school, nursery or group. 3. Take part in the 3P Pledge Champion Award & take action to help clean up the seas today! You, your family, group, class, nursery, school, charity or business can become 3P Pledge Champions & complete the 3P Pledge Champion Award. All 3P Pledge & 3P Pledge Champion logos are free to use to promote yourselves taking part in the Award. Scout groups, nurseries and schools are already taking part in the Award across Edinburgh and Fife, take a look at Wild Planet Explorer's Facebook page https://www.facebook.com/wildplanetexplorers/ to see some of their amazing pledge pictures and photos of what they've been up to! Find out more below. Scouts taking action for their Award! 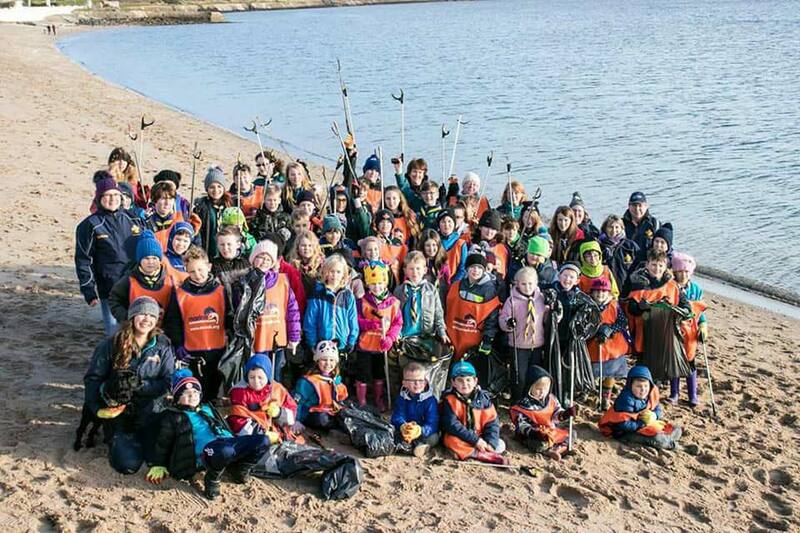 The 3P Pledge Champion Award is a wonderful opportunity for you to both help clean up litter but also help prevent any more entering our rivers & seas. The Award is fun, you'll learn lots & you'll make a difference not only to wildlife & the seas but also to others, by encouraging them to take action too & make their own difference. On completing the Award each individual will receive an I'm a 3P Pledge Champion or We're 3P Pledge Champion's certificate celebrating their achievements. Raise Awareness of the problem & encourage others to take action. The 4 actions are the same for everyone who takes part in the Award however HOW each action is completed varies. The Award is designed to be easily achievable & fun for individual, families, groups, schools, nurseries & businesses. To find out the detail of what actions you need to do as an individual, family, class, school, nursery, group or business, please email Wild Planet Explorer's founder Joanna McFarlane on joannamcfarlane@wildplanetexplorers.co.uk. Do I need anything to complete the Award? A passion to make change happen & the enthusiasm to take action! The 3P Pledge recording sheet to note what you do throughout your Award. You will be asked to keep your pledge, any pictures, achievements, records & thoughts on your 3P Pledge Champion work in one place as you progress through the award. After the Award you could go on to develop skills for free in marine species identification & outdoor survey projects through new Citizen Science projects & Wild Planet Explorers can send you more information on this. © 2019 · Wild Planet Explorers · Website by Wildflowers & Pixels.